Adobe Dreamweaver CS5 is a versatile web site development application, suitable for personal and business development environments. With over 12 hours of training, this course explores the concepts of creating a new site in Dreamweaver CS5, including configuring site properties and application preferences, adding content, and manipulating text. 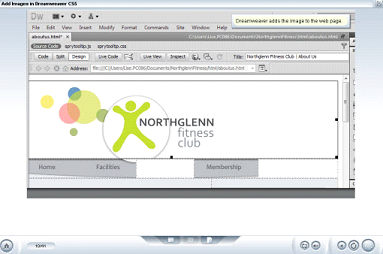 It offers a look at the major interface elements of Dreamweaver CS5, including Live View and workspaces, is also provided. Whether you are learning to create a website, maintain and edit an existing website, or just want to learn Dreamweaver CS5 and various types of cascading style sheets and style rules, this course will provide you with the skills necessary to help build an accessible web site that complies with web standards.. With our interactive exercises, the actual software is not required to be running on your computer. Review is easy with the option to do searches and print transcripts of each lesson.